FreeStyle USB Data Cable for your FreeStyle Meter. Data Cable is designed for FreeStyle Meter, FreeStyle Flash Meter, FreeStyle Freedom Meter and FreeStyle Lite Monitor. Download your results from your FreeStyle meter to your PC (via USB port). Data cable is used to download your testing results from your glucose meter to your PC. 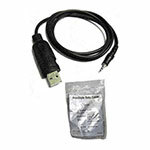 This data cable uses stereo jack to connect to FreeStyle meter (data port on the FreeStyle meter is located above the meter screen) and USB connection for connecting to your PC (all PCs have this data port).